UDM Downloads > VXEI picture uploader! VXEI picture uploader batch edits and uploads images very easy and fast. You will never have to worry where and how store and publish your pictures again. 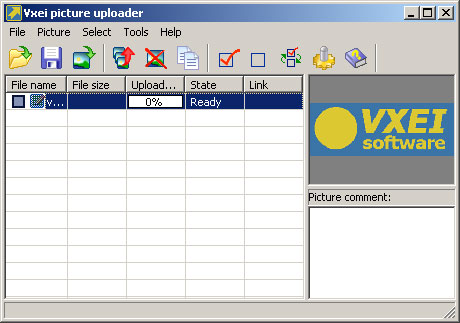 Main features of VXEI picture uploader: * Batch uploads your pictures. * Automatically formats links (to post in forum, HTML page or your own format). * Lets you select host where you will store your pictures. * Lets you save uploaded picture lists for future use. * Resize picture before upload, you can select resize algorithm. * Automatically add watermark to uploaded pictures. * Automatically add Selected border type to uploaded pictures. VXEI picture uploader comes with easy installer and uninstaller. Try it now.